Bardis House can accommodate 2 to 3 people. It has with 1 King size double bed and can take 1 more bunk bed in the living area. The bedroom is on the second floor with a private bathroom. 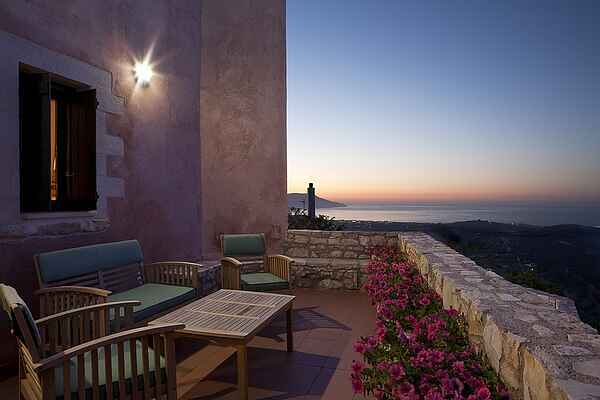 There is one balcony with furniture situated by the pool with breathtaking views of the sea and the mountains and a second smaller balcony on the second floor by the bedroom. The house combines harmoniously the traditional style with modern architecture, creating a warm and friendly atmosphere. For your convenience it is equipped with A/C, fireplace, Wi-Fi Internet access and plasma TV. A spacious open plan living area, open small kitchen where the kitchenette has a large fridge, a mini-cooker with two hobs, plus filter coffee machine, toaster and electric kettle. Delicate filigreed wood panels reminiscent of a Sultan’s harem are used as room dividers and the overall effect is one of history and romance. Α dining table and a comfortable sofa in the living room that can be converted into a single bed.